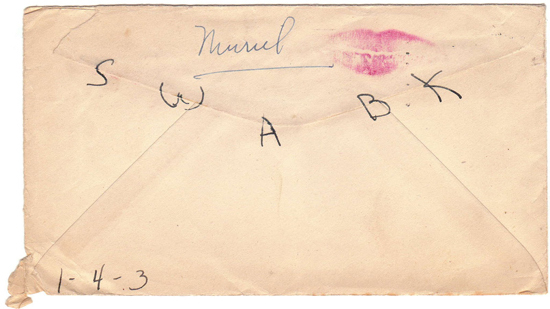 Above and below are envelopes from the Leon & Muriel letters from 1946. I love the old paper and the decorating of the envelopes. 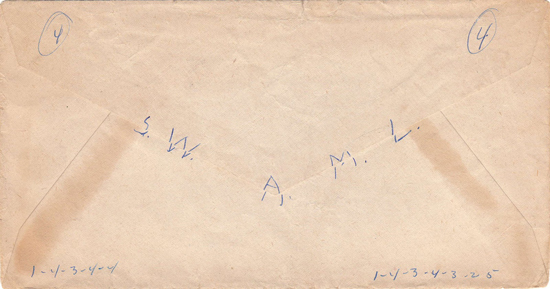 He wrote “S.W.A.M.L.” (I’m guessing sealed with all my love?) and “1-4-3-4-4” (I love you very much?) on the envelopes.. compare that to the texting language of today and the acronyms and abbreviations people use now on their phones. I think writing gives us a chance to express more than we would normally, or in a different way. It allows you to craft what you say and really think about what you want the person reading it to see and remember. If you’re reading this blog, you already know I’m a huge proponent of sending cards. Did you know USPS is going to discontinue delivering mail on Saturdays? People are sending less and less letters and writing less in general. Most states don’t require children to learn cursive writing anymore. This article shows some examples that the teen stars of today write like children. Writing is being replaced with typing. I think it’s really sad and it reinforces my belief in sharing cards and investing in the stationery industry. 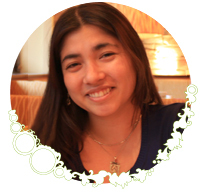 Writing has made me more creative, led to drawing skills, and allows me to express myself more than a computer can. I have so many notes and sketches that capture my ideas, and even though they are not searchable, or sometimes not organized, they remind me of what I was thinking and feeling more than a spreadsheet can. I am more creative on paper. I know there are apps that can probably capture my sketches, but there is a quality to paper and ink, the smudginess of pencil, and the creative inspiration that comes with filling a page. While I’m a huge proponent of graphic design and computers, it’s nice to be able to write and not rely on a computer. I’m going to go write a letter and mail it and it will take 1-3 days to get to my destination. So be it. My pinterest board of snail mail-related stuff. Follow my pinterest boards. Here’s some more pretty snail mail packaging. The Oh So Beautiful Paper blog. Tons of pretty snail mail.